The disease is an abnormal condition an uneasy state of the body. The human body is constantly exposed to micro-organism sometime these micro-organisms are so active that they enter the host body, multiply and result in a disease. Diseases are mainly of four types as shown below. The outbreak of disease is above the expected level. 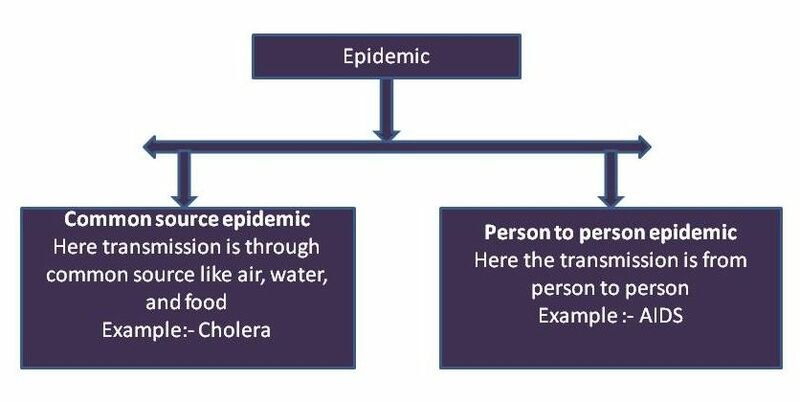 Epidemic disease is of two types as shown below. Endemic disease is a disease that occur at regular interval but at low frequencies. Examples:- Fever, Cough, Common cold. Pandemic disease is a wide spread disease. It spread in large population in short period of time. Sporadic disease occur occasionally with specific interval of time. In sporadic disease virulence of organism is low and population resistance is high.